The term 'miniature' is a description of a watercolour technique rather than the size of a painting. So although this painting may seem quite large, it is a miniature because it is painted in watercolour on vellum (fine animal skin). Such large miniatures are today called 'cabinet miniatures'. This is a recent term for miniatures that would have been kept in a cupboard or a room hung with other small paintings. Both spaces were then called 'cabinets'. 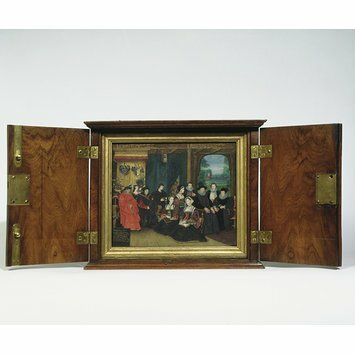 This miniature is in a frame with locking doors that was made for it by a former owner, the auctioneer John Sotheby (1740-1807). Sir Thomas More (1478-1535) was Lord Chancellor of England and also a distinguished scholar. In the picture he is seated beside his father, Sir John More. Behind him is his son John, holding a prayer book, and John's wife, Anne Cresacre. The three women in low-cut dresses in the centre are his daughters Cecily Heron (seated, with a closed book), Elizabeth Dauncey (standing) and Margaret Roper (seated, with an open book). The four figures with pleated ruffs are his grandson, also called Thomas More, with his wife Maria Scrope and their sons, John and Christopher Cresacre More. His 'fool' can be seen pushing through the curtain. This is a sort of visual family tree. In fact, the four generations could not have sat together for the portrait. The attribution of the miniature to Rowland Lockey is linked to large oil version of this painting that is signed by him. We know that Lockey was an apprentice of Nicholas Hilliard (?1547-1619) and also practised as a miniaturist, so this miniature is likely to be by Lockey. A group portrait of a family seated in an interior, a view of a garden through an arch in the right background. The painting is held in cabinet wiht double locking doors. Inscriptions in gold in the top left and bottom right corners. Miniature group portrait of Sir Thomas More, his household and descendants, watercolour on vellum, set in a walnut cabinet, painted by Rowland Lockey, 1593-1594. Strong, Roy. 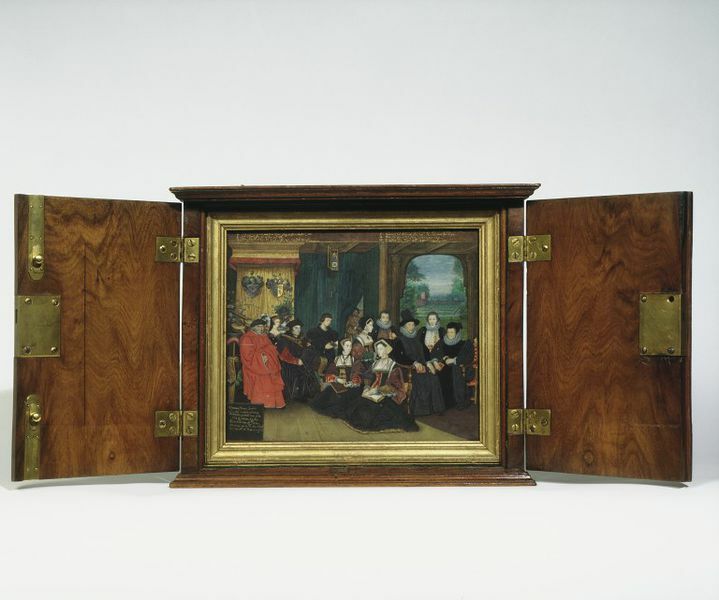 Artists of the Tudor Court: the Portrait Miniature Rediscovered 1520-1620. London: The Victoria and Albert Museum, 1983. The miniature is attributed to Rowland Lockey on the basis of a related large group signed by Lockey our knowledge that he was a pupil of Nicholas Hilliard and practised as a miniaturist. The picture is thought to be slightly later than the oil version in the National Portrait Gallery (dated 1593) because here Cresacre is shown clean-shaven wheras he has a slight beard and moustache in the miniature.